Pursuing the White Whale is my metaphor for the sheer impossibility of reading all of the great works of literature in one's lifetime. "It is to keep yours safe. You see, there was a time, ages ago, when they were not so separate. When doors ran between your world and mine, and others, and anyone with a bit of power could pass through. Magic itself could pass through. But the thing about magic," added Kell, "is that it preys on the strong-minded and the weak willed, and one of the worlds couldn't stop itself. The people fed on the magic and the magic fed on them until it ate their bodies and their minds and then their souls." In a world where three different London's exist. Not acting so much as parallel universes but rather as doorways to London's existing separately from each other. There were four London's once. The doors between all four of them were once open to anyone possessing magical ability. Black London was the hub of the magic, it ran through the city like veins. The people of Black London consumed the magic, and the magic consumed them. Black London crumbled on itself, and the magic destroyed the city, and the people, like a plaque. Because of the danger, Red London sealed the doorway to Black London, cutting Black London off and essentially, even if unintentionally, causing White London to act as a barrier between the two. Black London is no more, White London is a dangerous place, ruled by whoever has murdered their way to the throne. White London is a drained city, a washed out city. Red London is where life and magic both flourish. Grey London is a land without magic, and the people who call it home have long forgotten about it. A dreary city cast in shadow. Kell is one of the last Travelers - rare and powerful magicians with a coveted ability to travel between parallel universes. 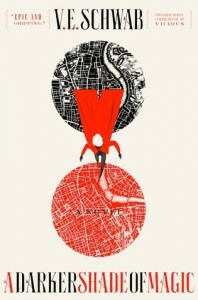 Kell is the Red Traveler, personal ambassador and adopted prince of Red London, carrying the monthly correspondences between the royals of each London. Holland is the only other Antari to exist. He is bound by the Dane twins, Athos and Astrid, rulers of White London. They rule through murder, cruelty, and binding magic. When the doorway to Black London was shut, all Black London relics were destroyed. Not only to keep the doorway to Black London closed and inaccessible, but to keep the magic sickness from spreading. So what happens when a Black London relic shows up and threatens them all? I loved the magical world that was created here, I loved the characters, and I loved the plot line. I eagerly await the second book to this trilogy. I have to say though, that it is easy to see through the lines and guess at the events that will be taking place in book two.